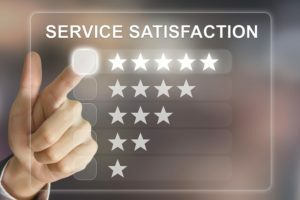 How valuable is a satisfied customer? If customer service training could help you and your team win over one happy customer after the next, what would that be worth to your business? Several years ago, a television news show put the renowned Nordstrom customer service to the test. With a hidden camera, an actor posing as a shopper attempted to return a piece of clothing to the Seattle-based retailer despite the fact that he bought it elsewhere. This “customer” promised the salesperson that while in the store he would spend lots of money, but he simply wanted to return the shirt as well. Would Nordstrom allow this? The word “Nordstrom” brings forward an immediate notion of “top-flight customer service.” This company astutely built its stellar legacy by hiring smart, capable people, and then inspired these employees to use their best judgment when dealing with its customers. It is not surprising that the Nordstrom saleswoman immediately accepted the merchandise (purchased elsewhere) to provide a happy customer experience. Empowered with her own judgment, it was unnecessary to check with a supervisor or belittle or question the customer’s motives. Nordstrom has achieved what top companies hope to be known for: empowering employees with high standards, and then turning them loose to achieve the best customer experience and service. An emphasis on the “customer” and customer service training has made Nordstrom and “excellent customer service” synonymous. Earning a sterling reputation like Nordstrom does not happen overnight. The quality of your employees must be consistent with your company vision and values in order to represent those values to the public. This requires customer service training which is an ongoing process, beginning with your visualization of what your business is all about, what it represents to the community it is styled to serve, and how well your people are enrolled in your vision. Employee productivity starts with your employees setting and achieving individual goals that are aligned with your company goals. This noticeably affects their satisfaction and your profitability. Done well, visionary communications encourage motivation. When your employees believe their opinions matter and their ideas are valued and encouraged, they take ownership of their positions and the quality of their output rises. Good leaders seek the ideas and advice of their workers, from the bottom up. Kevin Plank, founder of Under Armour (the popular sports apparel company), believes that hiring employees who exhibit great leadership abilities inspires others to work harder. Attitude is contagious – whether you have one employee or thousands. Meaningful communications on a regular basis keep an organization focused in good times and bad. Trusting employees in this process improves motivation and performance. When a leader empowers her people, they become motivated from within to gain confidence and use better judgment, all the while ensuring that their actions reflect the highest standards in which you wish to operate. Building a high level trust with your company, employees and clients is the end goal of customer service training. The evidence is overwhelming that employee morale increases when everyone is aligned with company goals. When establishing your business, a carefully defined strategy is about keeping your people enrolled in their goals and pursuing consistency with corporate objectives. It’s an ongoing process and one of the more important ideas to follow. Goals alignment of each employee is found in the review process of strong leadership. Using this method, an individual’s progress is monitored and it identifies and builds on a person’s strengths which are more important in my view than indicating weaknesses. The concentration is on personal development and redirection to avoid pitfalls. This is quite different than the typical approach to reviews, which concentrates on employees’ strengths and weaknesses. From my perspective as a coach, what appears as a weakness is often an overused strength. This is because a person may be experiencing some frustration in completing a project or in a relationship and is blocked by continuing to apply the same solution or ideas. Some refer to this behavior as insanity! Gaining employee engagement through an enrollment conversation that builds on strengths, allows for the expression of your business objectives. In turn, your employees are encouraged to share their objectives, resulting in a collaborative understanding that supports your vision. As a chief executive officer or an owner, it is critical to establish department leaders who encourage a personal sense of commitment that sets the stage for worker loyalty and higher performance levels. Keep in mind that valued employees stay longer, are more enthusiastic, and demonstrate loyalty during the best and worst of times. How will you build your well-oiled machine? Hopefully, it will run full tilt on all cylinders.